In my experience, most kids have a sort of "I'll defer to the adult" mentality when it comes to life. Not that they don't argue or try to express themselves or question adults, but there's usually an underlying feeling of "you're the grown-up here and you're probably right." Adult, and especially parental, opinions are given slightly more weight than that of peers and when an adult says to do something or states a fact, it's kind of taken that the adult is likely more correct than the child. Madelyn does not have this default setting. And I love it. If Madelyn has an opinion on something, she sees it as completely 100% equal to my or Angie's opinion. Even if what we're saying isn't opinion at all but is just fact. She takes nothing at face value and demands answers, not necessarily because she's curious (even though she is), but because she feels she deserves them. At times, this can be trying, but it's honestly one of the things we love most about her. We sometimes flash forward to her teenage years and preemptively cringe, but really, I know that those traits are exactly what will keep Madelyn safe when she's a teenager. They are the exact qualities we'll want her to have as she walks into a sea of overly judgmental and insecure peers. Her immense confidence and belief in herself will just make her that much more impenetrable to the typical teenage issues and will give her worried parents (because parents are always worried about their kids, no matter what age) a little more comfort. Now, I know she's only 19 months old, but it's amazing how much of her personality is evident this early and has been evident for so long. It seems like she was born knowing exactly what she wanted out of life. When we get frustrated with her when she's 15, we'll have to remember this is the same little girl that decided at only a few months old she was NOT going to drink out of a bottle no matter how starving she was. At day care, she would go the entire day without taking a single sip even though she was extremely hungry (side note: Madelyn is always hungry. We have never seen her get full from eating.). She has a near unbreakable will when she makes up her mind. She's also very independent. One of the situations where we got to see her personality come out was at the beach this summer. A wide open beach felt like heaven to her. Since the beach was so big and there really wasn't any way for her to get hurt, we would just sometimes let her wander to see exactly how far she'd go. The answer: REALLY FAR. The amazing thing to us wasn't just that she was comfortable wandering a beach by herself but that she almost never even looked back to see if we were following or see if what she was doing was ok. If she saw a bird a quarter mile down the beach and wanted to get closer, she'd just start walking. She didn't want or need anyone to come with her and she didn't feel the need to ask permission. She's completely fearless in that way and it's making Angie and I have to adjust our parenting a bit at times. Things that work on most kids don't seem to work on her. For example, Madelyn likes to just jump into the pool with no floaties on. She thinks it's hilarious and loves the mini adrenaline rush before she hits the water. We kept telling her not to do it because we can't always be within catching distance but she kept going. So we tried the "tough love" parenting approach and decided to not catch her one time and let her go under. She looked at us with a mischievous smile, jumped right into the water and ... we just watched. We watched for an uncomfortably long amount of time but we wanted her to learn the lesson. Once we figured the lesson had been learned, we pulled her above water. She coughed up some water while trying to catch her breath and wiped the hair from her eyes. Then she looked right at us with a smile and yelled "More! Again!" and scrambled to get out of my arms. Lucky for us, the pool is closed now because I have no idea how to parent around that one. Madelyn is also funny. Like, really funny. She loves making people laugh and knows exactly what to do to make it happen. She makes goofy faces, funny sounds, falls on the floor; whatever. She'll do anything for a giggle and mostly because it makes her laugh too. She actually just seems to have a knack for…can't think of a better word here…manipulating emotions in general. If we're at the dinner table and she throws food on the floor, she'll look at me and if I'm about to get upset with her she'll put on her sad eyes and point to her latest bump or scrape and start pitifully saying "boo boo, Daddy. Boo boo" to try to distract me and make me feel sorry for her. I know better than to feel sorry for her but it does sometimes work in that I can't help but laugh. It's just too funny to see this sweet little girl try her hardest to get out of trouble and know that I have a soft spot (ok, maybe a soft crater) for her sad face (ok, really just her face in general). Another thing about Madelyn at this age is that she never stops moving. She's always doing something. She's running, she's climbing, she's wandering, she's tackling somebody, she's dancing, on and on. She'll sit in a chair just to get out of it and then sit in it again. Being at the pool with her and Patrick is an exercise in multi-tasking that would challenge even the most seasoned multi-taskers. It's because of her non-stop movement that quiet, still times with her are that much more amazing though. When she waddles over with a book in her hands and sits on your lap to read, it will melt your heart. We put her to bed awake, but every night we read books and then I turn off her lamp and we just rock for five or ten minutes. Silently rocking with her in the dark, listening to her breathe and feeling her weight in my arms is truly one of the highlights of my day. Madelyn's sweet side also leaps to the forefront when it comes to babies. It doesn't matter whether they're real or not; she LOVES them. One minute she'll be chasing Patrick around and wrestling and the next she'll pick up a baby doll and just stand and sway with it. Her whole demeanor changes and she suddenly looks much older and more mature. She pats them on the back, kisses them and gives them pretend bottles. And when she puts them "to bed" in the pretend basinet she takes extreme care in very carefully straightening the blanket out before gently laying it on them. If it's a real baby (which really means any child under 3) she's a little less gentle but no less sweet. 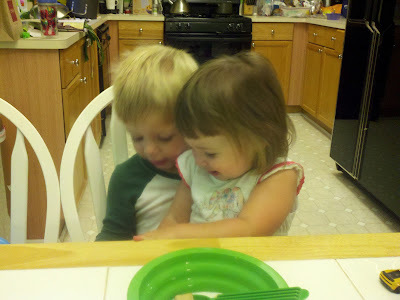 Cousins Carson and Creighton can give first hand testimony to Madelyn's insatiable desire to hug. Her teachers at school tell us she often just walks around hugging all the kids in her classroom and trying to give them kisses, giggling all the time. Madelyn's vocabulary has been expanding a lot lately, also. In the last month or two she's added a ton of new words. One of her favorites is "C'mon!" for when she wants you to follow her or do something with her. We went to Grandma and Grandpa's house a couple weeks ago for Uncle Thomas's birthday and we were all sitting in the family room with kids music on. Madelyn was, of course, dancing like crazy but would then walk around the room and grab people two at a time and yell "C'mon!" while pulling them by the pant leg into the middle of the room. If anyone sat down she'd dance her way back over to them and repeat the process. And that's the funny thing about Maddy; for as independent as she is, she loves everyone and can't wait to have fun with every person she meets. Speaking of people she loves, I don't think there's anyone else in the world Maddy loves more than her big brother. She lights up when he walks in the room and idolizes everything he does. Patrick has learned Maddy-cakes will try to imitate almost every sound he makes and thinks it's hysterical. They play a game almost every night at dinner where he'll start making sounds or saying words and Madelyn will echo each one. It always starts with the same nonsense sound ("me-maw me-maw") to signal the beginning of the game and then it changes to whatever other goofy sounds or words Patrick can think of. The game goes until the two of them are laughing too hard to keep playing. Madelyn loves to just be close to Patrick. The other day when I was getting them ready for school, Madelyn wouldn't stray more than a few inches from Patrick's side the whole morning. She ended up sitting on his lap while he ate his breakfast. Luckily, Patrick is a very patient little boy and loves his baby sister just as much as she loves him. Madelyn, we love you more than you'll ever know. You are the sweetest, silliest, most beautiful and determined little girl and we wouldn't change a thing about you. Our lives are a million times better because of you and we enjoy so much watching you grow up! Madelyn captured at 18 months is so perfect Toby! Maddy you will look back and read this and say "really?" --yes sweetie really! You are and will always be Madelyn Claire Joy! What a blessing she is--and how amazing to see her already so sure of who she is. All of her funny, cute, and open-hearted traits will serve her so well in life! Love you, Maddy Cakes!